Home » Squirrels » Where Are The Reds? Places within our area known traditionally to have red squirrel populations include: Witherslack, Longsleddale, Kentmere, Ambleside, Sawrey, Hawkshead, Langdale, Torver and Coniston. 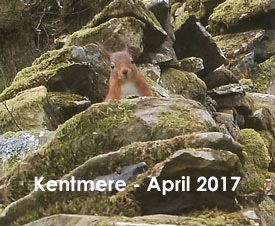 Our annual Red Squirrel Maps>> record red sightings as they are reported to us. Our maps go back as far as 2010 showing where sightings have been reported over the years. Our red squirrel populations have not yet recovered to the extent where we can confidently predict where a red squirrel sighting is more or less guaranteed, but things are moving in that direction. 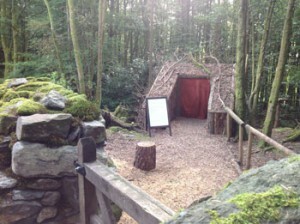 There is a new red squirrel hide at Rydal Hall>> – a lovely place to visit. Overlooking a dell in the wood, ropes, perches and feeders have been well positioned to attract different birds as well as squirrels. The entrance is opposite the car park for Rydal Hall. 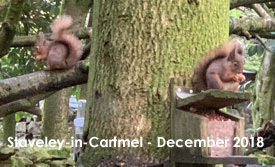 The Betty Fold Gallery>> advertises red squirrels in its garden, and we are recording a lot of red sightings around the National Trust Basecamp at High Wray. 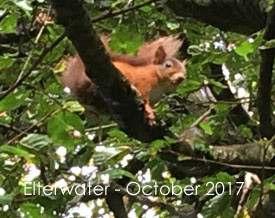 The National Trust property at Allan Bank>> just outside the centre of Grasmere is now attracting red squirrels thanks to the hard work of our neighbours, the Grasmere Red Squirrel Group.